In 1461, the mysterious enigmatic Nicholas is in Florence. Backed by none other than Cosimo de' Medici, he will sail the Black Sea to Trebizond, last outpost of Byzantium, and the last jewel missing from the crown of the Ottoman Empire. But trouble lies ahead. Nicholas's step-daughter - at the tender age of thirteen - has eloped with his rival in trade: a Machiavellian Genoese who races ahead of Nicholas, sowing disaster at every port. And time is of the essence: Trebizond may fall tot he Turks at any moment. 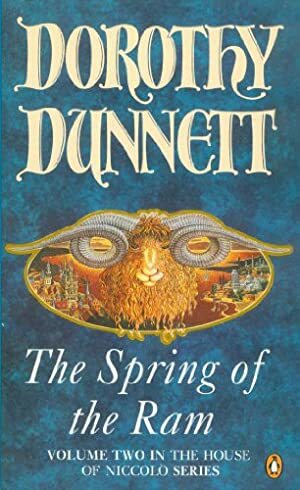 Crackling with wit, breathtakingly paced, THE SPRING OF THE RAM is a pyro technic blend of scholarship and narrative shimmering with the scents, sounds, colors and combustible emotions of the 15th century. The price of this book has changed 17 times in the past 2,464 days. The lowest price to date was £3.79 last reached on October 31, 2015. This book has been £3.79 one time since we started tracking it. The highest price to date was £13.29 last reached on May 27, 2015. This book has been £13.29 one time since we started tracking it.